UMX Metal Hinge, Latch, Clamp Hardware Accessories For Wood Jewelry Box, Cigar Box Purse, Wooden Boxes. UMX Wooden Box Hardware Accessories. Metal hinges, latches, box top handle clamps for wooden cigar box purses, wood jewelry boxes, wooden boxes etc. LT-21: Durable Wooden Box Latches, Box Purse Latch, Cigar Box Purse Latch Supplies. LT-25: Card Board Box Latch, Cigar Box Purse Latch, Paper Box Latches. LT-30: Gold, Nickel, Black Nickel, Antique Brass Latch With Screws. LT-31: Latches Hooks: For Box Purse, Wooden Box, Cabinet or Wood Craft Box Latch Hook. LT-40: Cigar Box Latch, Door Latch, Tool Box Latches. 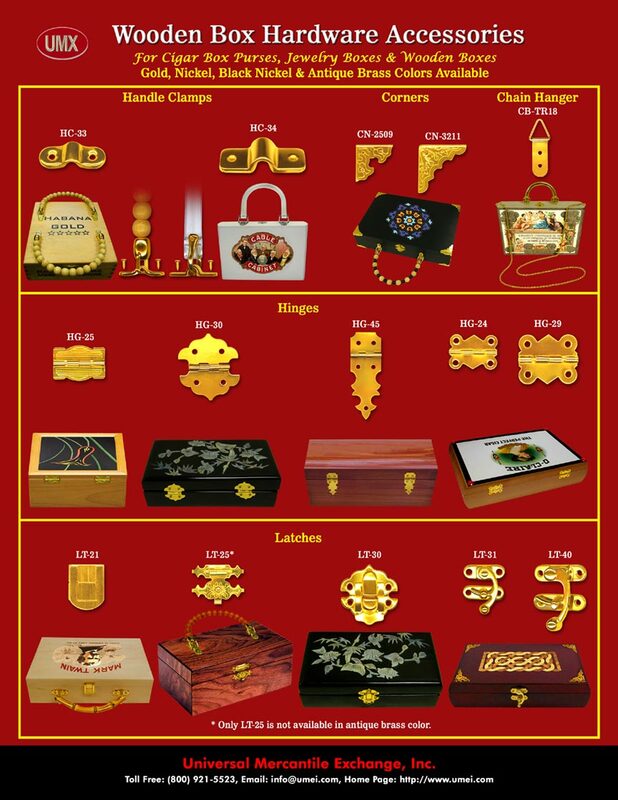 Latch: Cigar Box Purse, Wooden Boxes, Cigar Box, Box Purses, Wood Jewelry Boxes, Paper Box, Gate, Window, Drawer, Cabinet, Door and Tool Box Latches Hardware Supplies.